Another one of our beautiful high quality constructed metal fireplace screens is this Neoclassic style offered in a brushed steel finish. A handsome accessory to add character and panache to your living or family room while protecting yourself and your floors from flying sparks. The feet and handles detach quite easily and come packaged separately during shipping. Flat screens function very well, as they can hug the fireplace surround and are not bulky like their curved cousins. 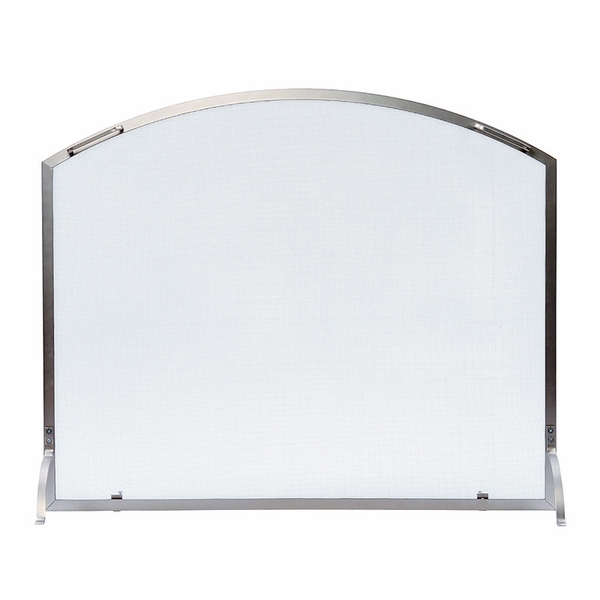 We also carry screens with small doors which provide safety while stoking the fire without removing the whole screen. Two sizes are offered in this style. What is the height at the center, the height at the sides, and the width of this Minuteman fireplace screen? This screen is 44" wide, 29 1/4" high at the sides, and 36" high at the center. First of all this item arrived with half of the hardware missing. The screen itself seems to be sturdy. It is attractive. It is quite heavy. The killer is that there are dozens of tiny pieces of wire sticking out of the frame at the top. If you touch the top you will be stuck or cut by one of these wire end pieces. ConsWire ends sticking through frame top.